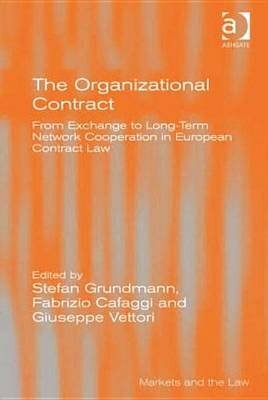 This book introduces and develops the paradigm of the organisational contract in European contract law. Suggesting that a more radical distinction should be made between contracts which regulate single or spot exchanges and contracts that organize complex economic activities without creating a new legal entity, the book argues that this distinction goes beyond that between spot and relational contracts because it focuses on the organizational dimension of contracting and its governance features. Divided into six parts, the volume brings together a group of internationally renowned experts to examine the structure of long-term contractual cooperation; networks of contracts; knowledge exchange in long-term contractual cooperation; remedies and specific governance rules in long-term relationships; and the move towards legislation. The book will be of value to academics and researchers in the areas of private law, economic theory and sociology of law, and organizational theory. It will also be a useful resource for practitioners working in international contract law and international business transaction law.